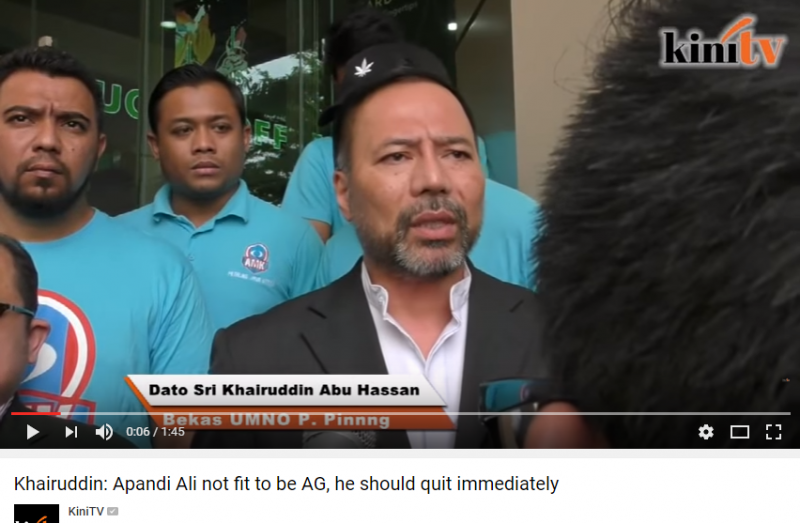 Screenshot of the YouTube video posted on the KiniTV channel about the press conference of a Malaysian politician criticizing the country's attorney-general. Head staff at two independent news websites in Malaysia are facing cybercrime charges for posting a video of a politician criticizing the country’s attorney general. The government accused KiniTV and Malaysiakini editor-in-chief Steven Gan and CEO Premesh Chandran of violating the Communications and Multimedia Act of 1998 (CMA), which criminalizes “the improper use of network facilities by knowingly transmitting contents which are offensive, menacing, obscene, false and indecent with the intent to annoy, abuse or threaten another person”. The charge is related to a KiniTV video posted on July 27, 2016 of a politician criticizing the office of the attorney-general for its failure to identify the role of the country’s prime minister in a corruption scandal involving 1MDB, a state-owned investment bank. The politician, a former member of the ruling party, called for the resignation of the attorney general. The video was taken during a press briefing. KiniTV is an Internet TV broadcasting news about Malaysian politics. It is part of Malaysiakini, an independent online news website with a large subscription base that has faced regulatory challenges and technical attacks in the past, often related to its political coverage. If found guilty, both Steven Gan and Premesh Chandran could face a prison term of one year, and could be subject to fines of 50,000 Malaysian Ringgit (roughly USD $11,500). An additional fine of 1,000 Malaysian Ringgit (USD $230) per day can also be imposed for each day the offence continues following conviction. This is not the first time that a Malaysian media website has been singled out by authorities for reporting about the 1MDB corruption scandal. In 2015, it suspended the license of some news websites for reporting about the 1MDB case. The corruption issue has sparked a political crisis in Malaysia since it implicated the prime minister, who is accused of pocketing USD $700 million through the 1MDB. The court hearing of Steven Gan and Premesh Chandran is scheduled for June 15. Both have pledged to file a constitutional challenge in response, since they believe the law is a violation of the country’s commitment to uphold media freedom.